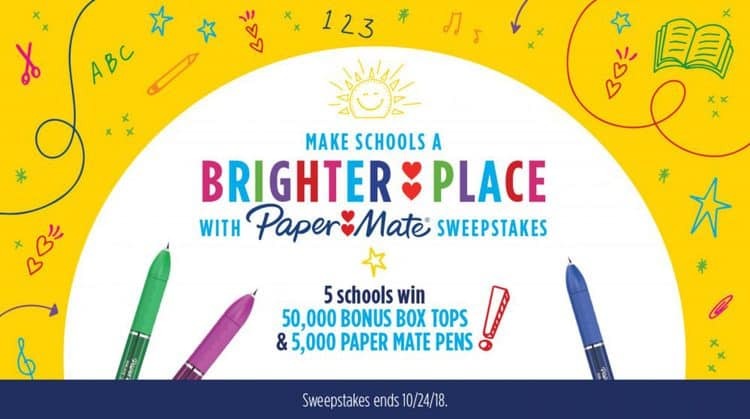 Win 50K Bonus box tops for your school & Make schools a Brighter place with Paper Mate Sweepstakes! Disclosure: I’ve teamed up with Paper Mate for this post in honor of this fun and exciting Sweepstakes!Find out how you can Win 50K Bonus box tops for your school All opinions are 100% mine. We all want to be able to help our kid’s schools. For many it’s through volunteering and giving a helping hand. However, we all know how hard it is for schools to be able to come up with a lot of the supplies needed for our kids to become successful. Well, here’s your chance to give back in a big way. Enter for your school to be one of the five schools to win 50,000 Bonus Box Tops and 5,000 Paper Mate Pens in the Paper Mate Sweepstakes! All you have to do to enter the sweeps is visit this link ! When you enter, there’s a chance the school you registered with could be one of five winners! The sweeps ends 10/24, so parents should enter soon for a chance to win for their school! Parents can also support their schools just buy purchasing any PaperMate product that has the Box Tops for Education logo on it, and products are available are retailers nationwide. So visit this link to give your school the chance to win big!! !